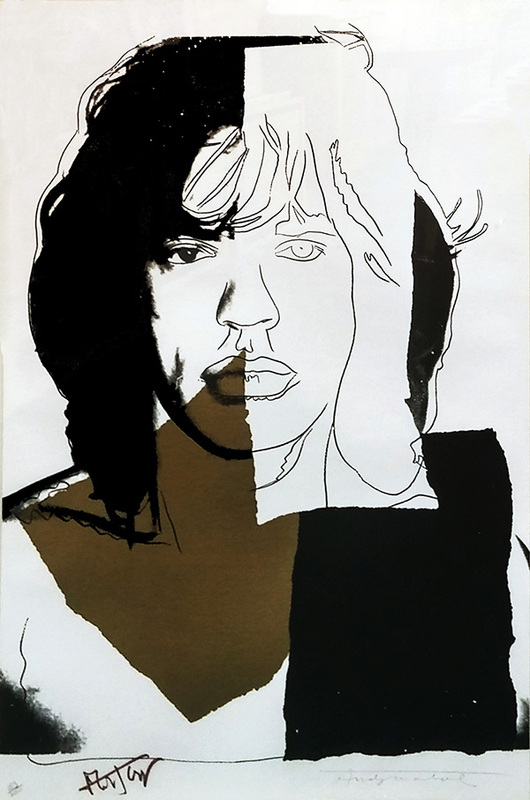 Description: Hand signed by Andy Warhol & Mick Jagger, numbered in pencil. Artwork is in excellent condition. Certificate of Authenticity included. Printed by Alexander Heinrici, New York. Published by Seabird Editions, London, England. In 1969 the Rolling Stones worked on their ninth studio album Sticky Fingers. The band approached Andy Warhol and asked him to design its sleeve. Warhol agreed and received a letter from Mick Jagger that included a polite warning not to make the cover too complex to avoid problems during production. Warhol ignored Jagger’s warning and went on to produce an unforgettable cover that featured a close-up shot of actor and “Warhol superstar” Joe Dallesandros. Warhol also expanded into the realm of performance art with a traveling multimedia show called The Exploding Plastic Inevitable, which featured The Velvet Underground, a rock band. Warhol also worked with his Superstar performers and various other people to create hundreds of films between 1963 and 1968. These films were scripted and improvised, ranging from conceptual experiments and simple narratives to short portraits and sexploitation features. His works include Empire (1964), The Chelsea Girls (1966), and the Screen Tests (1964-66).